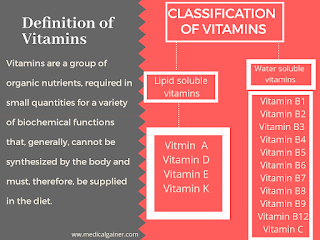 Vitamins are a group of organic nutrients, required in small quantities for a variety of biochemical functions that, generally, cannot be synthesized by the body and must, therefore, be supplied in the diet. 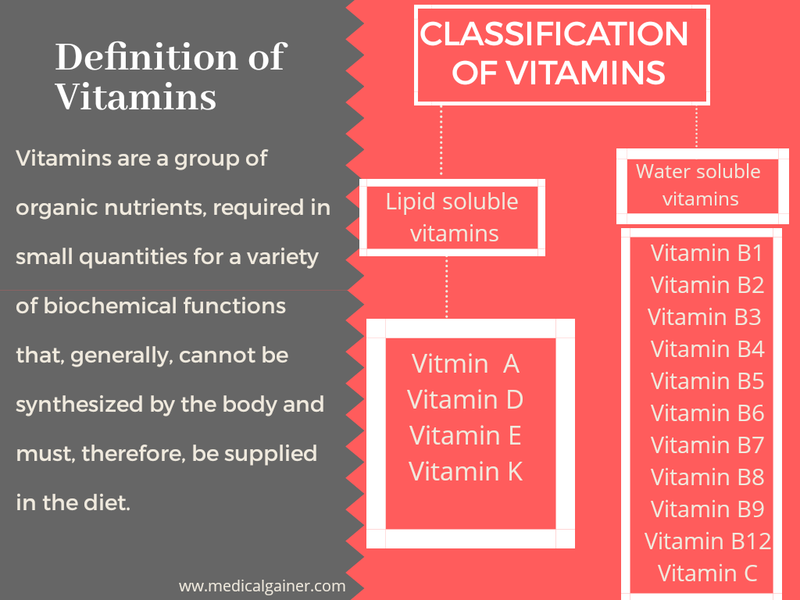 Lipid-soluble vitamins are stored in the body but, water-soluble vitamins are eliminated through urine and require high dietary supplementation. There are two types of vitamin A Retinoids and provitamins (Carotenoids). Retinoids comprise retinol, retinaldehyde, retinoic acid (preformed vitamin A, found in animal products). Carotenoids, found in plants, are composed of carotenes and related compounds. The alpha, beta and gamma carotenes and Cryptoxanthin are the most important provitamin A. It has antioxidant properties. Higher intake of vitamin A is toxic. Vitamin A is important for good vision, strong immunity, reproductive health and cell growth. Deficiency of this causes Night blindness, Xerophthalmia, keratinization of skin. Other ⇒ Cod liver oil, Lamb liver, Liver sausage, king mackerel, Salmon and bluefin tuna fish, Butter, Roquefort cheese. Vitamin D is synthesized in the skin, therefore, it does not follow the definition of vitamins and it is also considered a hormone. 7-Dehydrocholesterol is converted into pre-vitamin D in the presence of sunlight and this pre-vitamin D further converted into cholecalciferol, Which is absorbed into the bloodstream. A Higher dose of vitamin D is beneficial. The main function of vitamin D is to regulate blood levels of calcium and phosphorous. Deficiency of vitamin D in children causes rickets and in adult osteomalacia. Two families of compounds, The tocopherols, and the tocotrienols are named vitamin E. It is essential for normal reproduction, Hance is known as an anti-sterility vitamin. It is essential for the membrane structure and integrity of the cell, hence it is regarded as a membrane antioxidant. It prevents the peroxidation of polyunsaturated fatty acids in various tissues and membrane. it is closely associated with reproductive functions and prevents sterility. it increases the synthesis of heme. Vitamin E prevents the oxidation of vitamin A and carotenes. It protects the liver from being damaged by toxic compounds. It has been recommended for the prevention of chronic diseases such as cancer and heart diseases. Clinical trials in this regard are rather disappointing, hence it is no more recommended. Vitamin K exists in different forms of Vitamin K1 (phylloquinone) is present in plants.Vitamin K2 (menaquinone) is produced by the intestinal bacteria and also found in animals. Vitamin K3 (menadione) is a circulatingorm. It is very important for the formation of blood clots. Vitamin K acts as a coenzyme for the carboxylation of glutamic acid residues present in the proteins. It is also required for the carboxylation of glutamic acid residues of osteocalcin, a calcium binding protein present in the bone. Deficiency of vitamin K is very uncommon. there is no RDA for vitamin K since it can be adequately synthesized in the gut. Green leafy vegetables, spinach, collards, turnip greens, green leaf lettuce. Thiamine is the first discocompounds, namely the B complex group that's why it is named B1. Coenzyme TPP of Vitamin B1 plays important roles in carbohydrate metabolism. Function of vitamin B1 is synthesis of myelin sheath which plays an important role in the transmission of nerve impulse thus B1 is essential for nervous system functioning. It involves in carbohydrate metabolism. Essential for heart and brain functions. Deficiency of vitamin B1 causes "Beri-Beri". Vitamin B2 is also known as Riboflavin. It is involved in energy production in the body. Flavin mono nucleotide (FMN) and flavin adenine dinucleotide (FAD) are the two coenzyme forms of Riboflavin. It produces energy by carbohydrates, proteins, and fats. It Improves eyesight by reducing the development of cataract. Riboflavin deficiency is uncommon. it is mostly seen along with other vitamin deficiencies. Chronic alcoholics are susceptible to B2 deficiency. Milk and milk products, meat, eggs, liver, kidney are the rich source. Cereals, fruits, vegetables, and fish are moderate sources. Niacin is not strictly a vitamin since it can be synthesized in the body from the essential amino acid tryptophan. Niacin is required for healthy skin, energy production, and cell respiration. Niacin inhibits lipolysis in the adipose tissue and decreases the circulatory free fatty acids. The serum levels of low-density lipoproteins (LDL), very low-density lipoproteins (VLDL), triacylglycerol and cholesterol are lowered. Hence niacin is used in the treatment of hyperlipoproteinemia. Required for proper functioning of the respiratory and digestive system. Deficiency of Niacin causes pellagra. The rich natural sources of niacin include liver, yeast, whole grains, cereals, pulses like beans and peanuts. Milk, fish, eggs, and vegetables are the moderate source. Vitamin B6 is used to collectively represent the three compounds namely pyridoxine, pyridoxal, and pyridoxamine. It involves in the process of glucose formation by gluconeogenesis and glycogenolysis. Deficiency of vitamin B6 is associated with neurological symptoms like depression, nervousness, and mental confusion. Wheat, corn, cabbage, roots, and tubers are good vegetable sources.